In large skillet, cook bacon over medium-high heat 10 to 12 minutes or until crisp; drain on paper towels. Crumble bacon; set aside. In large saucepan, bring 2 quarts (8 cups) water to boiling; salt the water, if desired. Add broccoli and cauliflower; cover and cook 2 minutes. Remove vegetables from boiling water; immediately plunge into ice water until cold; drain well. 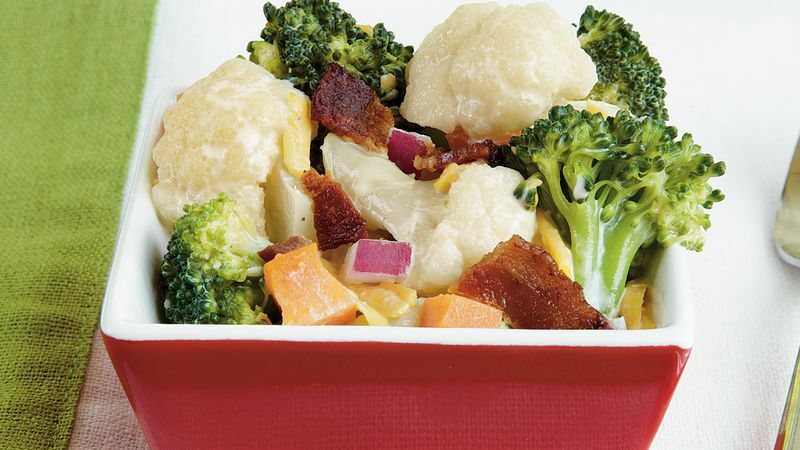 In large bowl, toss broccoli, cauliflower, cheese, carrot and onion. In small bowl, mix mayonnaise, sugar and vinegar. Pour over broccoli mixture; toss to coat. Cover; refrigerate 1 to 8 hours. Top salad with bacon just before serving.